Esoteric numerology is the science of number. The science, the psychology and the philosophy of number. Which is very different from what numerology is. We normally think and know through books that you were born on a certain day, you have a certain number in your name, and this automatically affects you. Esoteric Numerology says something different, because it explores the nature, the qualities and also the inner meaning of each numbers, which are the crystallisation of the purpose of the mind of God. It's true that each of us was born on a certain date, and it's true also that our name, the different letters, they give us a number which give us quality. But also the difference is that it depends how we deal with that energy. Numbers are fields of consciousness. They represent the bricks, the transparent bricks of the manifestation of the mystery of life. So each of us is here to work in a specific field of consciousness and the way the number is written on the board today or tomorrow it teaches us how we are dealing with that energy. So it doesn't mean that we are dealing with it in a proper way or that we are not dealing with it in a proper way. It simply means that it expresses our challenges and our difficulties and how we deal with each situation in each moment in our life. So it is really the expression of the energy of the soul so when we look at the numbers on the board, we look at them not as they really are. Not at the symbology of the number but what we look at is the energy behind the number because that energy affects us and that energy is what we need to work with. The beauty of Esoteric numerology is the fact that it offers us the possibility to develop our intuition. In English, intuition means inner teacher so to be able to learn how to listen to the inner voice and to be able to be guided by this inner voice that we have in each of us. The consultation is really a wonderful tool to understand our gifts and talents to understand what we are here for. To understand what is the purpose of our life but not only. In Esoteric numerology we also have a few numbers that we don't have in other systems, like the spiritual initiation number, the spiritual fusion number. We study the karmic numbers which talk about the karmic pattern we have the tendency to repeat in our life. So to have a consultation offers us the opportunity to understand which behaviour we have the tendency to repeat. In which moment in our life we might have challengers and how we can work from the consciousness point of view to become more aware of our self so that we can also be at the best and do the best in each situation. The workshop, I find it great because it offers us the possibility to really develop our intuition to be able to get to know this inner voice that we have so our life can be different. We can start leading our life not only from the mind point of view but really from the soul point of view and I really find this an extraordinary tool. Numerology is one of the oldest sciences of symbols. It began when life begun because life is vibration, consciousness, and each number is a vibration of consciousness. Numbers represent universal principles through which all things evolve and develop following growing cycles, they are a law unto itself which never deviates from the principle undelying the law that governs it. The digits from 1 to 9 are therefore, an expression of the passages needed to realization of an idea or concept and represent absolute truths because each of them is the symbol for a specific manifesting energy. Plato used to refer to it as "the highest level of wisdom" and Phythagoras talked about it as 'the essence of the cosmic and inner harmony'. There are no two identical numbers and each of us is imbued with the characteristics of the number he was born with, carrying the consciousness, the qualities and the life experiences that belong to that number. Numbers have a role in our lives, they are the transparent building blocks (transparent because they are concepts) of the manifestation of the mystery of life. From the moment we are born, we are given a time of birth, a date of birth, and count our years alive in numbers . Each number has its own individual vibration and meaning and, if we are open to it, it becomes a "doorway" on our history and on our soul. They support us in reconnecting with the energy behind existence in a way that allows us to see the energy pattern behind form and understand the spiritual significance and orderly progression of the manifestation of all things. When we learn to meet and know them, we can start to see the patterns and the cycles, and make sense of where we have been, where we are, and might yet be. Therefore, we understand the 'impulse', the 'heartbeat' of our own life. from understanding comes wholeness, peace of mind and compassion. Numerology offers the possibility to remove ourselves from the sea of illusions and to walk the clear path up the mountain of self-realization. Each number is an expression of the quality of life we lead. The understanding of their relationship and procession in our chart can provide great help in explaining the difficulties of the past or present circumstances and therefore ease them greatly by helping us to take steps of least resistance. 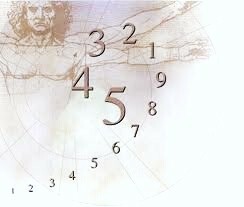 Numerology is a tool which allows us to develop our intuition and it is valuable to anyone who is interested in the art of healing, business, personal relationship, career choices and everyday life decisions because it is a means through which we can go back to our deepest memory and see the pattern of our life from the Soul point of view. In this way we can transform a crisis into learning process and offer ourselves a new way of observing our life. Numbers are therefore, great teachers because their effectiveness occurs when they open the way to the view and the potential of the soul.